Through the entire month of December, Plaza Low Yat has organized a Christmas Campaign, the Pengu-licious Christmas, featuring giveaways and redemption, as well as weekend performances as a jolly treat for shoppers. From 7th December 2018 till 6th January 2019, shoppers are entitled to redeem exclusive Plaza Low Yat goodies with only a minimum spend of RM200. When spending at Plaza Low Yat, bbpark, The Federal Hotel & Arcade and The Capitol Hotel, shoppers will receive one stamp for every spend of RM100, and redeem the Ella-Ella Umbrella with two (2) stamps, as well as shopping vouchers (worth RM20) with five (5) stamps. 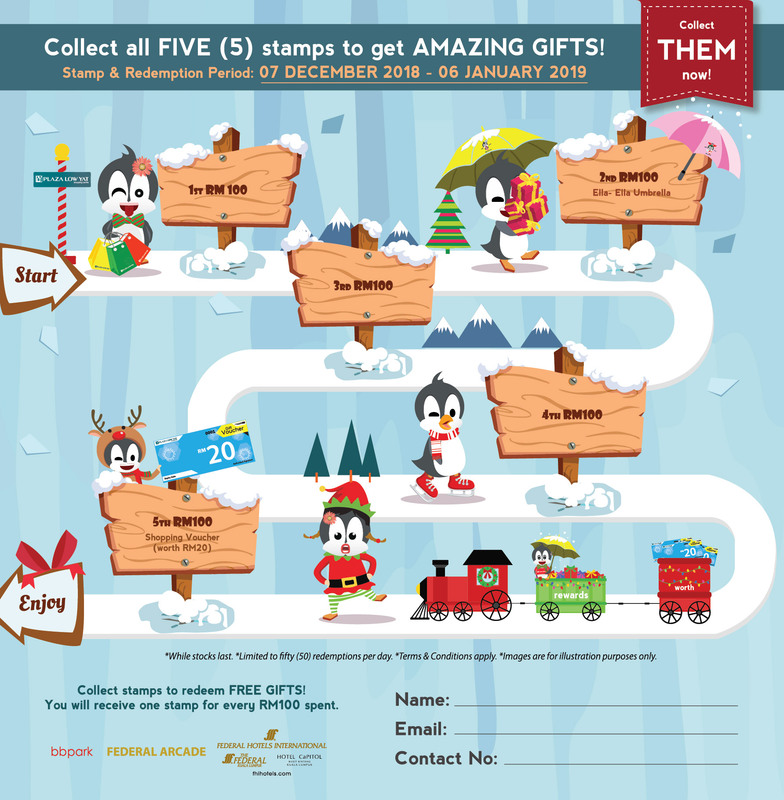 Shopper can collect the stamps using a custom booklet that contains all the information regarding Plaza Low Yat’s Christmas Campaign 2018. During the weekends starting from 15th Dec 2018, shoppers can immerse in the Christmas-themed dance performances that will be happening at the Main Entrance. Also, Santa Claus and his Santarina will be going about giving out free Ella the Penguin collectable badges to shoppers! The badges come in three different styles. 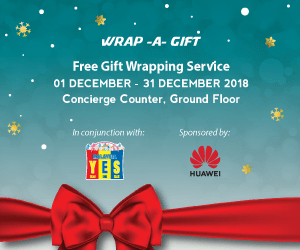 Need to wrap your presents after shopping at Plaza Low Yat? There is also a Gift Wrapping service at the Concierge Counter, located at Ground Floor of Plaza Low Yat. The Christmas decorations at Plaza Low Yat features a Pengu-themed set up, co-sponsored by Huawei. Decorations include boulevard lights and life-size photo op build-ups, a fortress at the Main Entrance welcoming shoppers and atrium lights to provide the Chrismassy vibe at the mall. Last but not least, there will be a Facebook Contest that will start from 10th-24th December 2018, as shoppers will stand a chance to win an OPPO F9 smartphone. Just Like and Follow Plaza Low Yat’s Facebook, Instagram and Twitter, and stay tuned to more updates and information about upcoming giveaway.